A well-respected Santa Barbara landscaping contractor Down to Earth Landscapes Inc. has just announced that they’re now offering a Free Comprehensive 42-point Lawn & Garden Evaluation. This comprehensive evaluation is designed to ensure that Santa Barbara area residents and businesses will have a healthy and safe landscape environment. A well-respected Santa Barbara landscaping contractor Down to Earth Landscapes Inc. has just announced that they’re now offering a Free Comprehensive 42-point Lawn & Garden Evaluation. 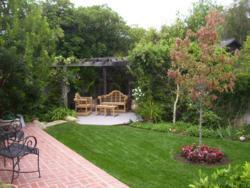 "We are passionate about the effect that a healthy and beautiful yard can have on everyone. We've seen how a vibrant landscape can offer a peaceful refuge from a stressful schedule," says Bruce Koehler President of Down to Earth Landscapes. "That is why we want to offer this evaluation to our Santa Barbara locals so they will know what they can do to revive their tired yards." This comprehensive evaluation is designed to ensure that Santa Barbara area residents and businesses will have a healthy and safe landscape environment. The evaluation covers all areas of the outdoor property including irrigation systems, lighting, drainage, soil conditions and planted materials. For home and business owners located in the Santa Barbara and Ventura Counties, the maintenance of lawn and garden areas is often neglected and compromises the health and beauty of the property. Weather changes that take place throughout the year often require special seasonal care to protect lawns and plants against these changes. This type of protection is achieved when you have the support of a qualified landscaping professional who understand the best methods for lawn, garden and plant care. The company’s 42-point evaluation is a comprehensive review process designed to thoroughly inspect all elements of the outdoor living areas to evaluate both functional systems and garden health. For example, the team at Down to Earth Landscapes Inc. will inspect all elements of the automated irrigation systems as part of the evaluation. Their technicians will determine the efficiency of irrigation systems and check the water stations for optimal coverage and water conservation. All components of the irrigation system will also be checked for leaks and breaks to ensure the mechanisms within the system are working properly. The Down to Earth Landscapes Inc. team will also check the health of the soil and plant material as part of the full evaluation. This includes the lawn area, shrubs, trees and roses. "The Free 42-Point Lawn and Garden Evaluation report from Santa Barbara landscaping contractor, Down to Earth Landscapes Inc., will provide the homeowner with an evaluation of the condition of their front and backyards and recommendations for maintenance and renovation," says Down to Earth Landscapes Inc President Bruce Koehler. To sign up for a 42-point Lawn & Garden Evaluation, local-area homeowners are encouraged to contact the team at Down to Earth Landscapes Inc. directly. To learn more about the company, please visit http://www.downtoearthlandscapesinc.com. Serving Santa Barbara County for over 40 years. Down to Earth Landscapes Inc designs, installs and maintains superior landscapes. They are known as creators of Exceptional Outdoor Living Spaces. Their landscapes have been featured in Sunset magazine, The Los Angeles Times and Food and Home magazine. They are winners of the Santa Barbara Beautiful award, and carry an A+ rating with the Better Business Bureau.